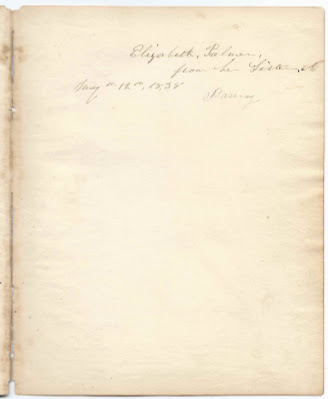 Journal-sized autograph album of Elizabeth Palmer, presented to her by her sister on May 12, 1838. I can't make out the sister's name, possibly "Passiny". The album measures approximately 7-3/4" x 6" and contains the sentiments, some of them two pages, of about 30 of Elizabeth's relatives and friends, most of them from Exeter, New Hampshire, or Roxbury, Massachusetts. 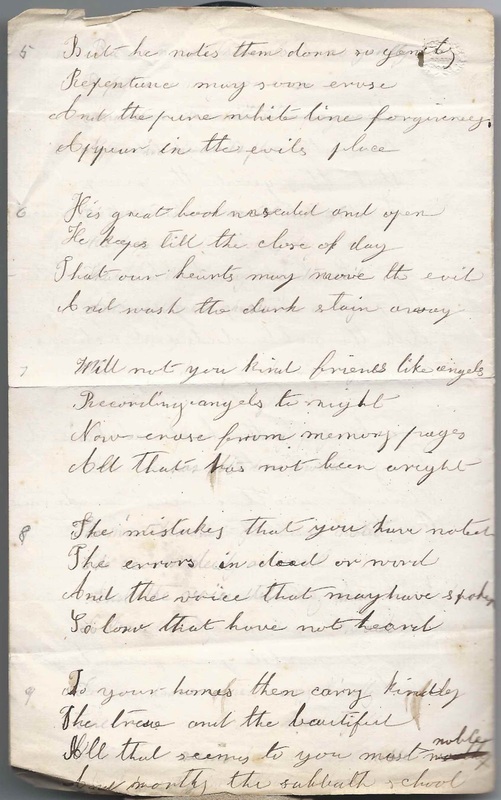 One of the signers wrote in pencil, and I suspect at some point later than the other autographs. She signed as Gracie Broaders of Charlestown, Massachusetts. 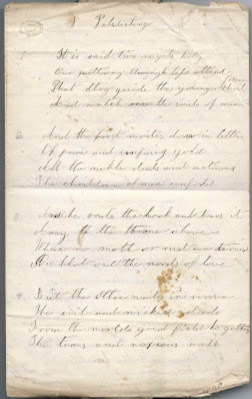 Gracie's entry is intriguing as I found that Boston bookbinder Frederick W. Broaders, son of John and Patience (Mann) Broaders, married an Elizabeth Palmer, born in Exeter, New Hampshire, or Canterbury, New Hampshire, and had with her three children, the eldest of which was Grace E. Broaders. Is it possible that album owner Elizabeth Palmer was Elizabeth (Palmer) Broaders? There's information on Frederick online but nothing much on Elizabeth. 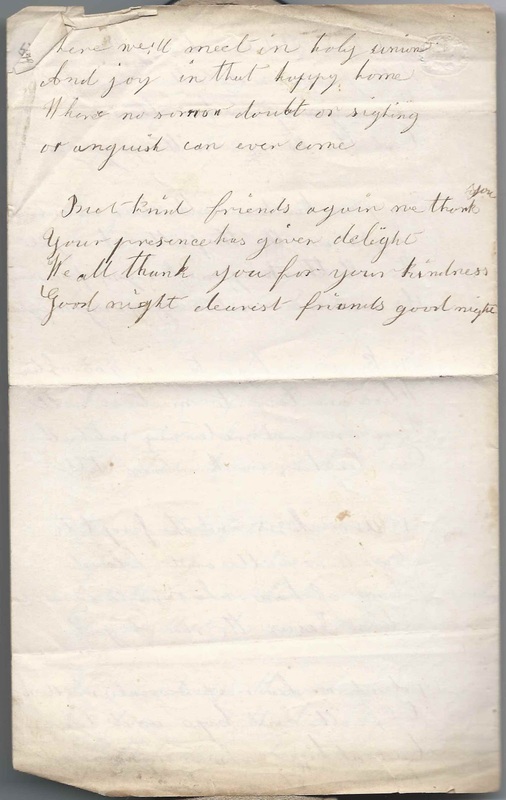 One of the signers was a Catherine B. Palmer from Exeter, New Hampshire, but quick research on her didn't reveal a sister Elizabeth. Perhaps they were cousins. Catherine signed two pages in the album. Another interesting aspect of this album is the set of six engravings interspersed throughout. 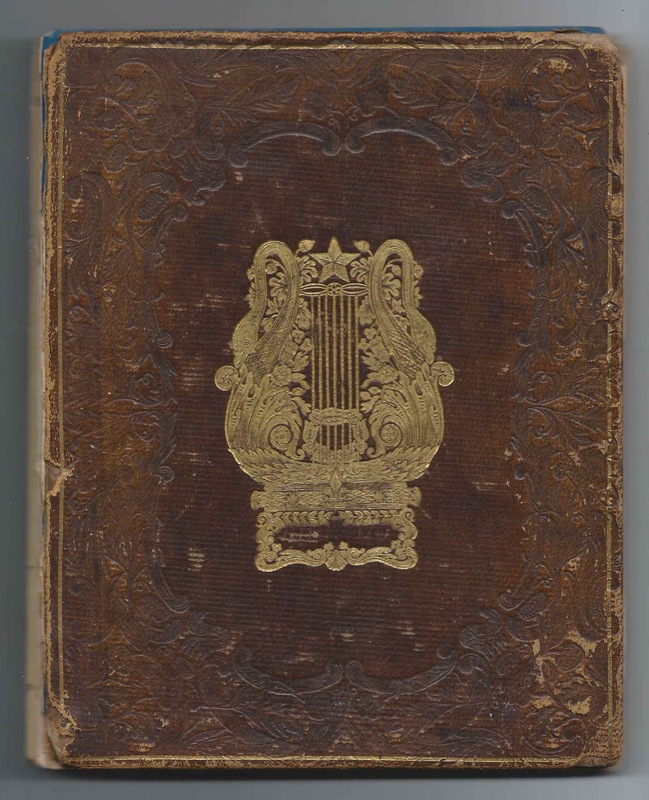 The album was published by J. C. Riker of New York and includes engravings by E. Gallaudet, J. B. Neagle, Joseph Andrews and V. Balch, after paintings or drawings by J. G. Chapman, T. Birch, W. W. West, G. L. Brown and Thomas Cole. 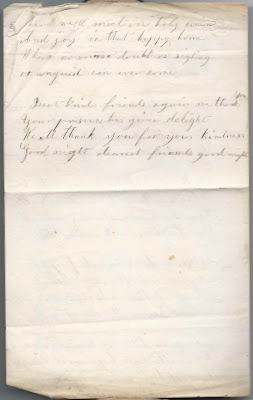 Tucked in the album is a sheet entitled "Valedictory"
If you have more information on Elizabeth Palmer, possibly Elizabeth (Palmer) Broaders of Exeter, New Hampshire, and Roxbury and Charlestown, Massachusetts, or information on any of the signers listed below, please leave a comment or contact me directly. Thanks! M. A. F. Possibly a Field? 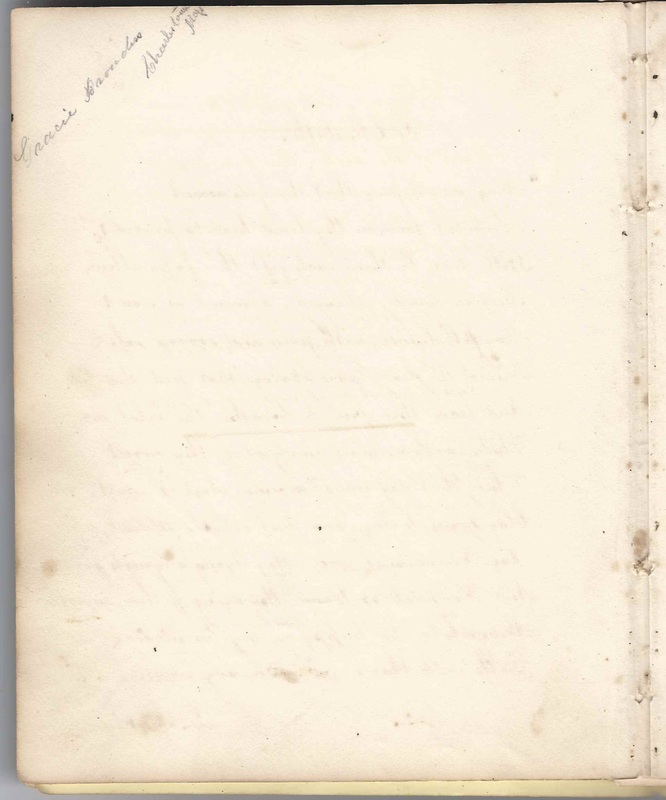 Very faint, signed by Phebe Ann; perhaps the Phebe Ann Field who signed another page. 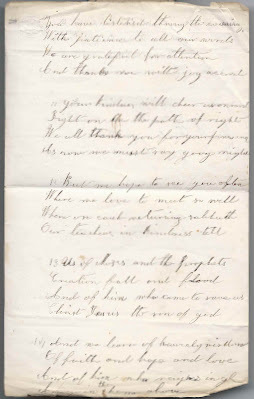 Page and overleaf signed at Roxbury, Massachusetts, on June 8, 1841, by perhaps C. or G.
Gracie Broaders of Charlestown, Massachusetts; written in pencil, likely long after most of the other pages were signed. Gracie may have been the daughter of album owner Elizabeth (Palmer). Electa N. Lincoln, signed on December 27, 1839; presumably Electa Noble Lincoln, born at Watertown, New York, on 12 May 1824, daughter of Martin and Susan (Freeman) Lincoln; later lived at Roxbury, Massachusetts; became noted educator and suffragist; married George A. Walton of Lawrence, Massachusetts in 1850. 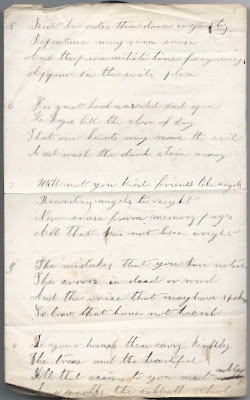 Sarah L. Mecuen, signed at Roxbury, Massachusetts, on February 23, 1841. Not sure of surname, but there was a Sarah L. Mecuen, daughter of John and Lois (Whittemore) Mecuen. She was born about 1823 and died in 1847. There was a later Sarah L. Mecuen involved in the Women's Relief Corps, perhaps a niece? 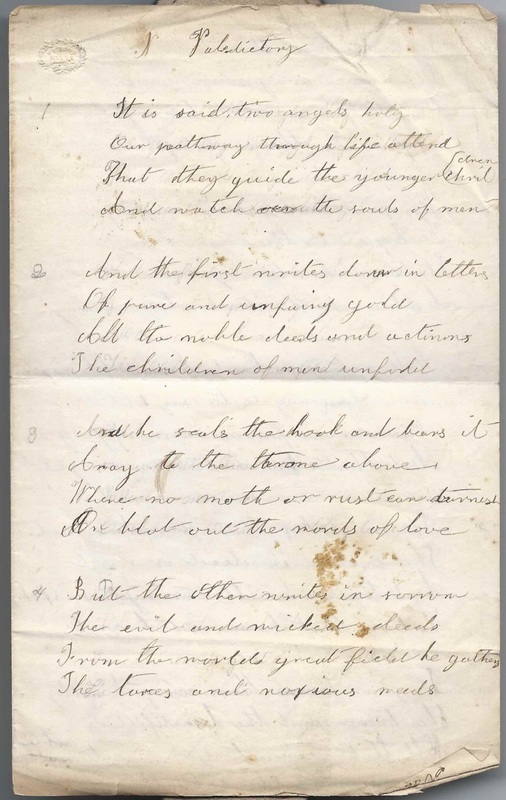 Elizabeth Palmer; the album was presented to her on May 12, 1838 by by her sister. Elizabeth may have been the Elizabeth Palmer who married Frederick W. Broaders. 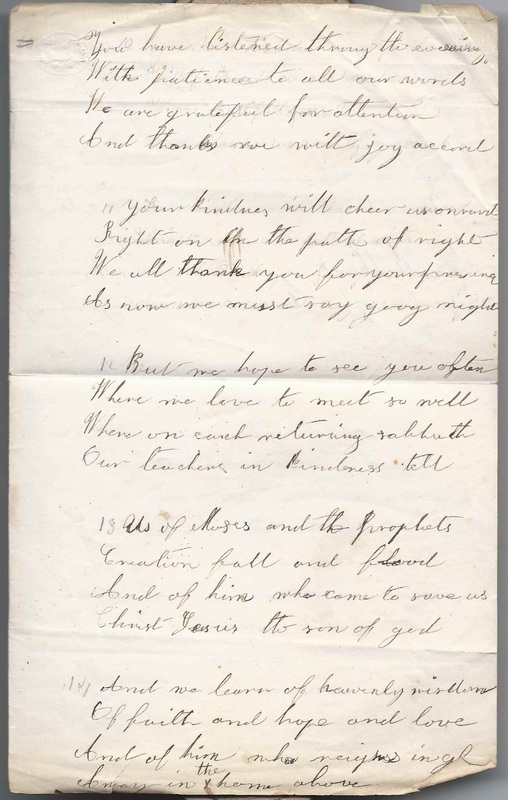 If so, her daughter Grace Broaders signed a page long after most of the other signers. 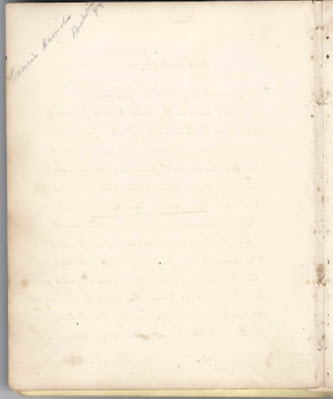 Catherine B. Palmer of Exeter, New Hampshire; she signed another page as well, unless the signer was a different Catherine B. Palmer.